“Selig sind die Hörer!” (Blessed are those who hear!) 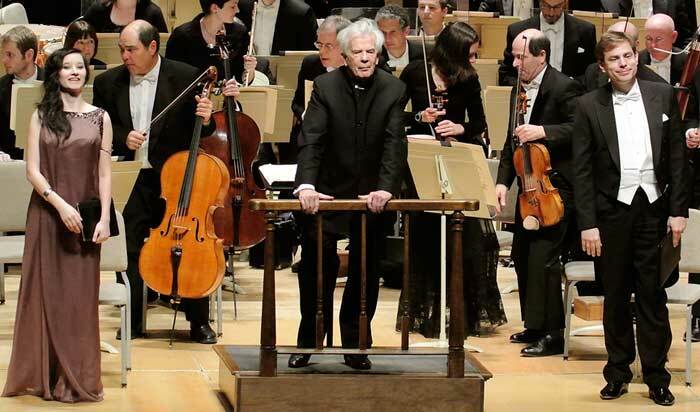 Last evening, the venerable maestro, Christoph von Dohnányi led the Boston Symphony Orchestra, the Tanglewood Festival Chorus, soloists Anna Prohaska and Hanno Müller-Brachmann in Brahms’s Ein deutsches Requiem at Symphony Hall. Prohaska’s appearance marks her debut with the BSO, adding to her extensive experience in opera, lieder and oratorio. Müller-Brachmann has been featured as a soloist with several of the world’s most prominent ensembles under conductors of equal renown; he has also studied with a number of prestigious coaches, including one of the leading interpreters of 19th-century German lieder, Dietrich Fischer-Dieskau. The combined forces offered a sensitive, supple interpretation of the work’s varied textures and temperaments, and the chorus displayed a remarkable unity of concept in their rendition of the Lutheran texts conveying Brahms’s humanistic spiritualism. This high level of unification included an impressive rapport between conductor and chorus, conductor and orchestra, and even the less-frequently-found rapport between chorus and orchestra, all of which was well served by the chorus’s memorization of the work. The only disappointment of the evening was the soloists. Although both executed their parts skillfully and gracefully (aside from an awkward initial entrance by Prohaska in the fifth movement), neither seemed to engage in the style or substance of Brahms’s work, remaining firmly in their own professional “terra firma.” Müller-Brachmann’s comportment, from his facial expressions to his posture (in addition to his singing style) were closer to what one would expect in of a light-hearted song cycle by Schubert or Schumann, the performance falling far short of the gravity of the baritone soloist’s quasi-theological texts. In the same manner, Prohaska’s performance largely resembled the light-hearted coloratura roles with which she has established her professional career rather than the tender mother figure that Brahms personified in the soprano solo from the fifth movement. Soloists aside, the ensemble communicated Brahms’s message of “comfort for the living, rather than the beloved departed” (to paraphrase the composer) in a very moving fashion. A small amount of reticence at the opening of the performance completely vanished by the return of the first movement’s opening music, a moment that what was perhaps the most sublime of the entire evening. If the recapitulation of the first movement was the most sublime, then the return of the opening text in the second movement (“Denn alles fleisch es ist wie Grass/Then all flesh is as the grass”) was certainly the most moving. The ensemble offered a very tender rendition of the simply textured fourth movement, and its promise of eternal blessing after death. The sixth movement had its high and low points: the chorus’s staccato articulation at the opening led to a loss of the “horizontal” qualities of the musical and textual line, though the fluidity and intensity of lines that followed created a very effective buildup to the Vivace of the triumphant, “Tod, wo ist dein Stachel?” (Death, where is your sting?) Dohnányi’s choice of tempo in the Vivace was very exhilarating, though it was generally too fast to allow the chorus effectively to articulate of the syntax of the text. All of these issues disappeared, however, in the group’s exuberant rendition of the movement’s closing fugue. The final movement, “Selig sind die Toten, die in dem Herrn sterben” (Blessed are the dead, who die in the Lord), offered a touching close to the group’s stirring performance. I have a very short term memory. I should write down sth before I forget. Is it too late to correct the spelling of “Muller” in the photo caption? rather than arranged SATB, and the violins were divided (yay.) The review is accurate. The TFC was indeed arrayed differently than I had previously seen them, but I believe the actual setup (Thursday) was tenors behind sopranos on the 1st violin side, basses behind mezzos on the 2nd violin side. I think of this as sort of a ‘church choir’ configuration. So, how did this compare to the Levine/BSO performance of a few years ago, which I think was eventually issued on CD? Gerry’s report of the chorus’s disposition is correct. You are right Nick; it must have been a little mental ellipsis of the two lines. Thanks! While we consider details of the text, perhaps someone could persuade the BSO to provide a translation of the text Brahms set rather than some equivalent from a handy Bible. “Wie lieblich sind deine Wohnungen” is rendered as “How amiable are thy tabernacles”! I understand where the second comes from, but it’s not a translation. Just one example among many. Brahms’ collection of texts from all over the Christian Bible is a wonder equal to that of Jennen’s libretto for Messiah. However, I don’t see anything “quasi” about these theological texts. I heard but did not see this performance. Mr. Muller-Brachmann certainly displayed the necessary gravitas in last year’s St. John Passion. Thanks for taking the time to comment! My characterization of the texts as “quasi-theological” refers to Brahms’s choice not to include any specifically “Christian” texts, that is, those that specifically name Christ or speak of those beliefs that are generally considered to be “required” doctrine for the faithful believer. This lack of doctrinal texts, in fact, led the impresario of the Requiem’s premiere to add doctrine-laden selections from the Bach St. Matthew as well as Handel’s Messiah (including “I Know that My Redeemer Liveth” from the latter). Thanks for that tidbit about the premiere, and I understand that common characterization of the selected texts. I am always puzzled, though, since two of the texts- including the first words uttered- are spoken by Jesus. The way that you just stated it is more precise, and I thank you. It drives me a little buggy to hear these texts mischaracterized as Unitarian, Lutheran, or secular humanist… these are all biblical texts. Certainly short on doctrine and mostly- though not entirely- universal. Last night we went to hear the Brahms German Requiem performed by the Boston Symphony Orchestra, directed by Christoph von Dohnányi. When I noticed the performance on our calendar I couldn’t remember why I had ordered the tickets. After the opening bars of the music I remembered. The designation, “German,” refers to the language in which the piece is written. The text consists of selections from scripture chosen by Brahms and follows no conventional liturgical form. The intent was to comfort all those who grieve; not to address the dead. Brahms felt free to craft the form of his own religion without seeking approval from any other authority; as a composer he felt free to draw from what had gone before without sacrificing his own originality. Brahms addressed the universal emotion of grief, as would Verdi a few years later, by drawing upon religious text without any obvious commitment to formalized religion. Both Requiems are works of such honesty, creativity and courage that they make debate about orthodoxy foolish in the extreme. Both composers combined music, the aural representation of the structure of the universe, with language, our tool for expressing our understanding, to provide a vision of what the world may be: somewhat predictable; full of surprise, terror and delight, confusion and comfort. Since the dawn of consciousness, people have been concerned with how to live their lives, and how to die. We find ourselves in a universe of our imagining among an infinite number of alternative universes and with no answers to the questions that trouble us, other than those of our own creation. Ultimately we choose our own text, make our own music. We find ourselves unable to alter our fate but free, and required, to craft our own individual requiem of acceptance and consolation. It helps to have a good model – and a committed and emotional recreation. What a pleasure to see von Dohnanyi, a conductor who can communicate so much nuance with eyes and hands alone, someone who functions for the sake of the musical performance alone without using his body and gestures to “sell the product” to the audience. The performance stressed the work’s “humane” values in a very natural, unmannered way. If the occasional “apocalyptic” moments were a little under-done, it seemed, in the big scheme, a small price to pay. Probably the best BSO concert of the year! I accidentally closed my IE tab, while I was editing my comments. It became a heavier burden for me to write it again. Without rewriting, it was already a burden to post sth with my poor writing skills. However, my dedication shall be known and this requiem is way too important for me skip commenting on its performance , given that I have made comments to some ‘minor’ works before. I heard the same performance as the reviewer did, Thursday. It cannot be emphasized enough that there is a ‘line’ in every work of the core German-Austrian repertoire. The low registered opening tells us the first movement should sound from DISTANCE. (It is a very strange thing that the reviewer hardly mentioned anything about the chorus.) The color/texture of the chorus should give us that distant sense, in peaceful, quiet and solemnly sober voice, yet in loving tone. This atmosphere continues to the 2nd movement, which is a march and the most dramatic movement (to some extent, the drama carries on to the 3rd movement). From that DISTANCE, the voice of the chorus starts with the quiet level (as in the 1st movement) and steadily grows in volume and in emotion, with the help of the timpani. It was so emotional, the audience cannot escape from it (the sorrow/life is real!!!) But to understand the personality (or the greatness) of Brahms, one has to notice that when briefly reaching the climax, the chorus quickly recess from fff to ppp, the same level as before. That was most sublime (I think I used right word here) and that is the ‘line’. I have to point out, it is crucially important to understand that the 1st movement is more a ‘chorus’ piece and the 2nd movement is more a ‘symphonic’ piece. Several days after the performance, some of my observations may have turned into illusions. I try to be faithful to what I heard. In the 1st movement, I started to feel that the string was too ‘weak’. But I felt ok, because of its chorus nature. And I was not in the best position, just under the low ceiling. The acoustic could be very different from listening to the CDs. What I felt strongly about was the POOR quality of the chorus. They were not a well disciplined ensemble. Not being too picky, I also don’t want to hide my disappointment on the way they dealt with the endings ‘-en’ ‘-et’ and so on. Nonetheless, the 2nd movement confirmed my previous impression. The BSO was not symphonic enough. In many passages, one would expect hear the strings (esp. the 1st violins) to enter clearly and stir/modulate the emotion (perhaps bad choice of words). For example, at ‘bis auf die Zukunft des Herrn’, the violins should be clearly and beautifully heard. Then followed by the woodwinds… Unfortunately, I did not hear enough. The chorus dominated the 2nd movement and the drama was reduced. And they did not have distinctive colors for different parts of the music. It has become ever harder for me to comment on the soloists. I only have place for two names in my mind, Janowitz and Van Dam. Even though I knew I probably would never be pleased by anyone else, I wanted to be reasonable. I gave the tenor higher remark. The BSO did him injustice in the 3rd movement. I wish it was just my illusion, the flute and the oboe made very ‘snobbish’ voice, when he sang ‘every man at his best state’. It is like they were mocking at that miserable man, whom does not know his end. BTW, later in the 3rd movement, there was a gaffe from the chorus. Von Dohnanyi had a lot of movements with his baton in right hands. It was possible that they could not follow him. The 5th movement has somewhat embarrassing tempo. I think the conductor had to increase the tempo to help the soprano. I can’t remember exactly where, but her voice was in a rush of ‘joy‘ when she sang ‘und habe grossen Trost funden’. That annoyed me very much. 4th, 6th and 7th movement sound more balanced. I don’t remember where I wanted to have comments. Thanks everyone for your contributions to the conversation! My description of the chorus as “reticent” at the opening of the performance does not refer to a lack of power/volume/ect, but rather to a lack of ensemble cohesion, which seemed to result in a hesitancy from the performers themselves. The opening of the first movement is certainly one of the most touching from the 19th-century choral repertoire; it is the return of the gentle, rocking music from the opening (following the comparatively expansive setting of the “tearful” section of the text), that I chose to characterize as “sublime”; this characterization is in keeping with the popular 19th-century conception of sublimity as relief from tension, created by a return to the peaceful state of being that preceded the introduction of discord. It is also a particularly gratifying musical moment, as Brahms finally gives us the missing 3rd of the F chord from the very opening, revealing it to be an F-dominant to the tonic B-flat. A wonderful piece of music, worthy of hours and hours of discussion!